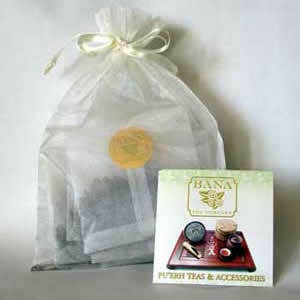 Would you like to try 7 of Bana Tea Company's premium teamaster selected Pu-erh teas? Our Tea Sampler Set is a terrific value at only $25 plus shipping. We designed this beautifully packaged Tea Sampler Set to help tea connoisseurs discover the diverse flavors of the Pu-erh teas that Bana offers. A sheer organza sack tied with a satin ribbon contains 7 labeled samples of loose tea chipped off of our Pu-erh tea cakes and bricks. Also included is a mini brochure with descriptions on each tea in the sampler as well as brewing instructions for best results. This sampler makes a wonderful companion gift for a gift certificate or any of our accessories, especially for the novice Pu-erh enthusiast. The sampler consists of Bana Limited Edition, Denong Red Label, Denong Wild Ripe Pu-erh, Sweet Clarity, Large Tribute Ripe, 2016 Commemorative Raw Cake, and Little Bingdao . Each sample contains 8 grams of tea leaves (.28oz). Produced from ancient 100-400-year-old tea trees, this tea presents a crisp freshness with a delicate dried apricot flavor. Broken from cakes, this tea has been aged in Kunming, Yunnan for over a decade. The word to describe this tea is delicious – clean, savory and sweet. Made with leaves from wild tea trees, this tea is rich, complex and smooth. With a full-bodied, syrupy finish in the throat, this savory tea works for all occasions. This tea offers a rich mouth-feel and a quick and long-lasting "hui gan" (return sweetness). Enjoy the fragrance and briskness of this young raw pu-erh. This ripe Pu-erh offers a thick and smooth mouth-feel with a hint of Chiese Herbal aftertaste. At about the fourth infusion, a sweetness emerges that give rise to a nice finish. Made with early spring leaves from arbor trees, this tea is thick, full-bodied and smooth. The aroma of this tea is elegant and it finishes with a nice floral fragrance, which can be delightfully savored. * Teas selected for this sampler is subject to change without prior notice. This is a perfect and affordable introduction to pu-erh tea. I was able to sample a variety of teas and discover that I enjoy the deep,earthy flavor of ripe pu-erh - smooth, complex and lingering without a hint of bitterness. I was also pleased with how quickly I received my order. The only slightly confusing thing is that the samples are 8 grams, but the brewing instructions are for 5 grams of tea. I use 9 oz or about 250 ml of water to brew each packet of tea and I'm a happy sipper. i am in the process of sampling the teas. I have been drinking Pu'erh for many years but I just bought the variety that was in the tea store. Now I am savoring each sample and totally surprised at my different tastes. Some just tastes like regular green tea to me but I am also learning not to let it steep too long. In short, I am enjoying my education process and hope to be in a position to order my tea from you properly in the future. On my first order, I ordered one of your least expensive cakes and was completely overwhelmed by the outstanding quality and taste. This time, I ordered another more expensive cake, some mini cakes for travel, some loose green tea, and a sampler set for a gift. The one problem with your tea is that all other teas now taste inferior. I had never heard of Pu-erh tea before but now I can't live without it. Thank you for your excellent brand! Our responseThank you so much for the high praise. We will continue to work hard to bring the best teas we can find to our esteemed customers.